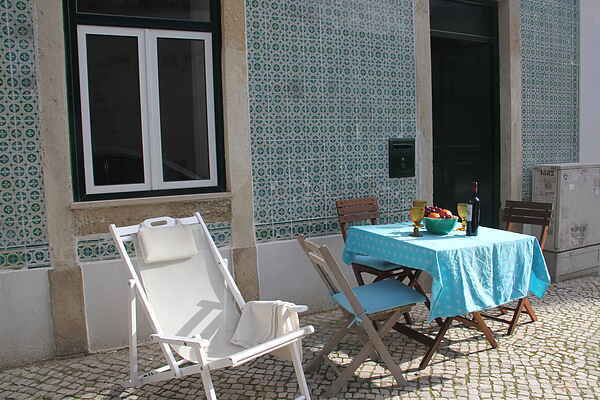 This ground floor apartment boasts a very good location in the centre of Lisbon - in the Alfama area, Lisbon's maybe most famous area! Good size rooms, bright bedrooms (each with a window), a modern renovated bathroom and a living room which opens to the street (where you can actually set your chairs and tables, there is space for it! ), this apartments has it all. The street is very quiet, with trees on both sides. It is located very close to the Tagus river and the Santa Apolonia metro and train station. The Flea Market takes place right next door, there on Saturdays and Sundays you can make great bargains and find some rare objects! The garden Boto Machado garden is 200 meters away and will allow you to make some nice relaxing strolls. All the main touristic spots of Lisbon can be easily reached, by foot or metro. Nice restaurants in the neighbourhood and if you like typical fado music, there are concert restaurants in the Alfama area.